Earlier today, the world’s first and most expensive crypto currency was going down while continuing the downtrend seen a day before. According to CoinMarketCap, the BTC exchange rate dropped below 8300USD/BTC, though it recovered a bit later on. Over the last 24 hours, the currency lost more than 5% of its dollar value. Experts say that the Bitcoin exchange rate is now getting closer to 7900-8100 USD/BTC area of support. If the exchange rate decides to test the support area, it may well have a hard time overcoming it right away. 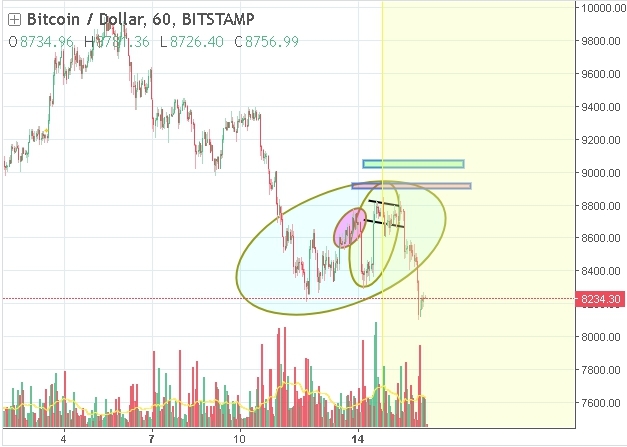 However, the bearish scenario – the one promising a move down below 8000 USD/BTC – is obviously not the only viable scenario for the BTC market. Apparently, if the news background improves and turns bullish, this may well change the situation. In particular, there is an annual cryptocurrency conference. It’s called Consensus. It’s currently taking place in New York. The results of the conference (if positive) may eventually back the entire global market of digital currencies. One again, some good news may reverse the situation and bring the BTC exchange rate back to 8800-9600 USD/BTC – the price range the exchange rate used to stay in early May when every other expert was expecting a move above 10000 USD/BTC in a matter of weeks or even days. Now that the situation has changed, they are not in a hurry to specify when the cryptocurrency conquers the resistance level.